The University of Exeter in the UK, did a study on kids and their understanding of Jesus in hopes that they could develop better teaching materials for religious classes. It turns out that most kids have no concept of who Jesus is and are greatly confused as to His death and resurrection and the stories of Scripture. In reference to the Resurrection, one boy asked: “If he rose from the dead, how come he ain’t here now?” Others wanted to know why Jesus didn’t help them today, and why he doesn’t “come down” and tell everyone He is true. Certainly we have seen that the Church of England has lost some integrity and has resorted to strange tactics to get people to come to it so there may be some faults in their teaching ability, but I really don’t think the kid’s ignorance of Jesus is really much of a problem. Kids don’t understand anything! The idea of Christian education for kids is to give them a foundation. I don’t fully understand the resurrection either. But you gotta start somewhere. Author jeffPosted on September 30, 2006 Categories Uncategorized2 Comments on Jesus Who? Christ is the answer to all the world’s problems. I fully believe that. He is The way, The truth and The life. But just telling a dying world, who has no concept of what they are doing, that they need to ‘let go and let God’ does not help. Being perfect helps no one. Jesus lived a perfect life, and that helped no one until he died and rose again. Jesus’ perfection was part of a larger work, the work of redeeming the world. God loved the world, that’s why He sent Jesus Christ. Why would God, who is perfect, love this messed up place that is destined to destruction? The same reason believers, who are perfect in Christ, should. Love. One of the hardest concepts about God for me to grasp is why He loves this world. The answer is quite simple, He loves what He has made regardless of what He has made has done to itself. The essence of love is humility. The essence of humility is humiliation. Dispensationalists would rather show you their timelines with the artwork than show you love. The underlying reason why dispensationalists do not offer any help to the world is because we are better than the world, the world is going to pot and nothing can stop God’s plan, I have the chart to prove it. God is better and more perfect than any dispensationalist. He wrote a whole book to help life on earth. The reason He did that is because God so loved the world. We know this because He demonstrated His love for us by sending Christ. It’s time for us perfect people to take a lesson from our perfect Creator: humble yourself, love the Lord and love your neighbor. It’s quite simple really. The openly gay mayor of Palm Springs, Calif., said in an opinion piece published Friday that he was only showing “Christian courtesy” in welcoming an “ex-gay” group to his city Saturday, CBS News reported. Well, it’s at least nice to see that Christians are the source of outrage rather than being the outraged ones. Rather refreshing. The mayor is right, of course, and it is nice to see a “man” take a stand for decency. All the cries for us to be tolerant of gay people is not so easily returned. There has been a vast branch of dispensationalism that has espoused the concept of the victorious life. Let go and let God. Christ has made me perfect, therefore I am and there is nothing I can do to make myself any better. As much as I agree with the spiritual truths these statements are based on, the fallout has been near disastrous. Lazy. While relaxing in our own sufficiency, we have let the world slip on by. It doesn’t do anyone any good for you to be perfect and victorious. It is only when the perfection and victory of Christ are shared that the Body of Christ is truly edified. 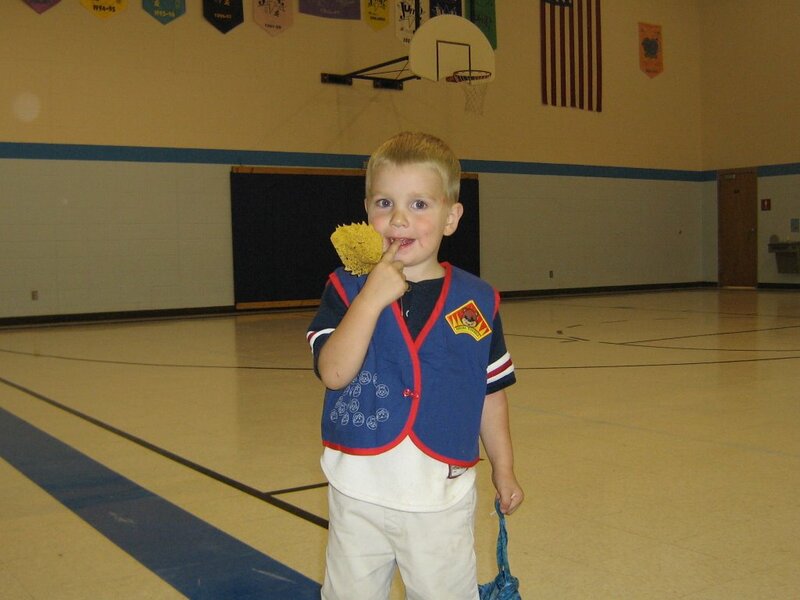 My son began work in the Cubbies program at our church’s Awana club. He got his vest this past week and is quite proud of it. I’m not sure how much of the Bible memorization is sticking with the boy, especially considering he can’t talk. But you gotta start somewhere. He gets into it more than I expected. Enjoy the cuteness. And pray for my boy. That means that you can pray to your God but shouldn’t mention specifically who he is out of respect for other religions present. A response by a military chaplain says that should be no problem because the majority of chaplains have all ready been doing that. His conclusion: back in Washington, a thoroughly inconsequential debate is taking place about prayer while important things such as military pay, medical benefits and housing are put on the back burner. These are the very benefits many soldiers are including in their daily prayers. Let’s answer these prayers quickly. Who says prayer doesn’t work? It just depends who’s praying!